Fire headed into the final game of the regular season knowing that victory of City would almost certainly send them into the semi-finals of the 2018 competition. Anticipation was high for the hosts although it was the visitors who had the game’s first opportunity. From a free kick down the City right, a floated ball across the penalty area went unchallenged by Fire but fortunately the striker’s header was misdirected and went harmlessly wide. This early scare jolted Fire into life. In the 4th minute pressure from Fire’s forward line forced the City keeper into a poor clearance which was intercepted by Dre Ngaha, but in a crowded penalty area an effort on goal failed to materialise. Fire now had an energy about their game, Herbie Allsopp won a succession of tackles in the City half and receiving the ball back from Ngaha, sent a cross over to Mark Shaw, the ball finding its way back to Ngaha who slotted home from ten yards to give Fire a 6th minute lead. In the 12th minute Fire won a free kick within shooting range. Ngaha tried his luck but the wind seemed to gather the ball and drag its trajectory towards the keeper who was able to make the save. Soon after Fire had another opportunity to add a second, after clearing a City corner Fire counter-attacked with pace, Shaw bursting into the City area sent an effort agonisingly wide. Fire continued to dominate and press for an elusive second, Bradford Green showing good vision to send Allsopp free down the left, his pass put Kaidin Dawson in behind the City defence, but his cross was saved by the opposing keeper. Moments later a combination of quick Dawson and Jett Brutnell passing put Shaw through, he rounded the advancing keeper, but the angle became too acute and his effort was wide. Fire’s front three were relentless in giving the City defence a hard time; once more Shaw was free down the right in the 25th minute his cross into the middle slashed clear by a desperate City, fighting to keep themselves in the game. Just before the half hour, Fire won another free kick in a promising situation. Lachie Noyes stepped up to City and replicate his wonderful strike from last week but this time, he was off target. Fire remained in the ascendancy, Shaw seeing another cross cleared before a 31st minute interchange between Allsopp and Ngaha saw the ball taken off Allsopps toe before he could pull the trigger. After a promising half, Fire could have scored a number, however had to settle for a slender one goal advantage going into half time. Fire kicked off the second 35. But like the first half it was the visitors who stated brightest, forcing a corner after 38 minutes before winning a free kick a minute later 25 yards out. From the set piece City sent a stunning drive that flashed past Green to level the game at 1-1. Following the equaliser Fire were clearly rattled and it took another 10 minutes for them to regain their composure to push on for the victory. In the 50th minute City scrambled clear a Fire corner, Tanner Mathers picking up on the loose ball to send an effort just wide. Ryan Tappouras, Noyes and Dawson then combined to set Mathers up again, the keeper making a save to concede a corner from which Noyes could only send his close-range, instinctive effort agonisingly over the bar. Mark Shaw was still full of running down the right after evading a heavy challenge he put another cross into the City area but under pressure the visiting keeper did well to hold onto the ball. Luke Vancam, pushed forward from defence in an effort to find a winner tried an effort from distance on the hour mark and after Green had cleared, Shaw was able to send an inviting all to the back post for Dawson whose first-time shot was again kept out. Despite their best efforts and a myriad of opportunities to win the game sadly for Fire the winner they craved would not come and with the game ending honours even, Fire’s season was over. The season has seen some outstanding performances, from individuals and from a growing maturing team, some narrow early season losses perhaps taking their toll when it came to the crunch. 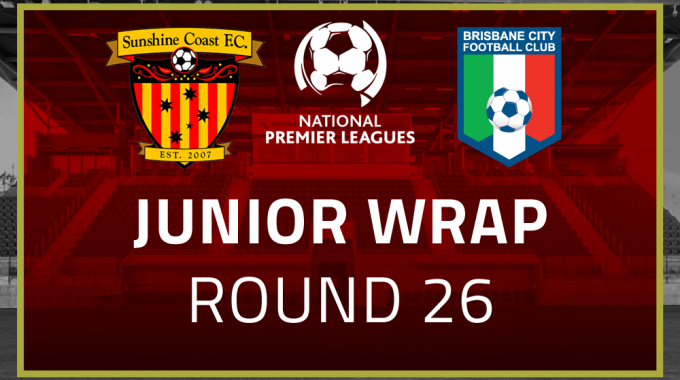 The last round of the regular 2018 season and the Sunshine Coast U14 Boys were looking to finish on a high. Sunshine Coast FC always looks forward to competing against Brisbane City FC and the strong competition they offer. Sunshine Coast FC looked to increase their lead before half time however the solid Brisbane City FC defence kept the remainder of the half scoreless. Returning to the pitch Brisbane City FC placed increased pressure on Sunshine Coast FC’s defensive line. Working together Sunshine Coast FC held strong in defence. Both teams kept competing until the very end with no further change in the result, securing Sunshine Coast FC 3rd place and a position in the inaugural Junior NPL Finals Series. After a season riddled with injuries this is a fantastic achievement for these boys and we wish them every success in their Semi Final against Brisbane Lions this Wednesday and hope to see them in the Grand Final. Fire played top of the ladder Gold Coast team the Friday night and clenched a 3-0 win, So although still sore they were determined to come out a play a great game. A win for City today would secure the Season Premiership. City scored first in the 14th minute. Boshoff and Vochteloo had the opportunity to score minutes later but it kept getting cleared on the line. Numerous other opportunities came Fire’s way during the first half but City kept us out. Boshoff would score for Fire in the 43rd minute to equalise the game and lift the team. City retaliated two minutes later to score and take the lead. The ball was passed back to Fire midfielder Emery off kick off who intelligently noticed their keeper very high and seized the opportunity to take a shot from over half way. The ball never looked like it wasn’t going in. The game was equalised again now 2-2. Emery would score again for Fire in the 68th minute and Boshoff again in the 74th minute. The pressure was on City for a comeback. And that is what they did. They scored in the 78th minute and again in the 80th minute to equalise the game.